Sign up for a free trial of Gorilla 6 Budgeting and Scheduling now! Created by filmmakers for filmmakers, incorporating the ideas of real-world users, Gorilla is an intuitive suite of tools that helps you make sense of all your scheduling needs. A proven production aide for experienced pros and a fantastic learning tool for beginners. And, with Jungle's strong user community and responsive technical support team, you’ll have dependable people to guide you every step of the way. 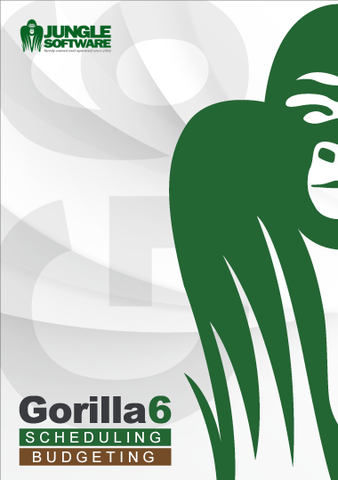 Watch the video below to see all of Gorilla 6's new features! Designed for filmmakers of all levels, Gorilla Budgeting 6™ brings you traditional film budgeting in a tightly integrated software package. 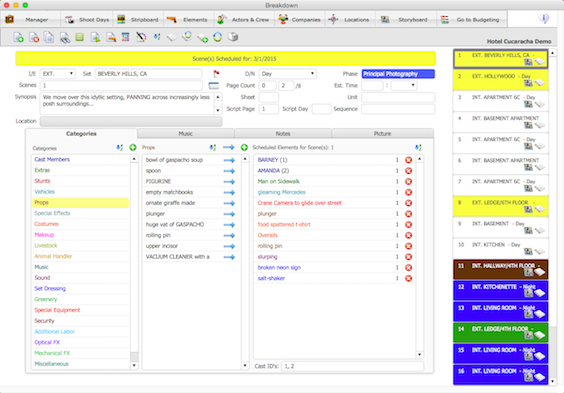 Includes four level budgeting, dozens of templates to choose from, globals, fringes, tax credits, expense tracking, integration with Gorilla Scheduling™ and more can be administered with ease and precision. Industry-Standard Budgeting – Including Topsheet, Account, and Detail levels. 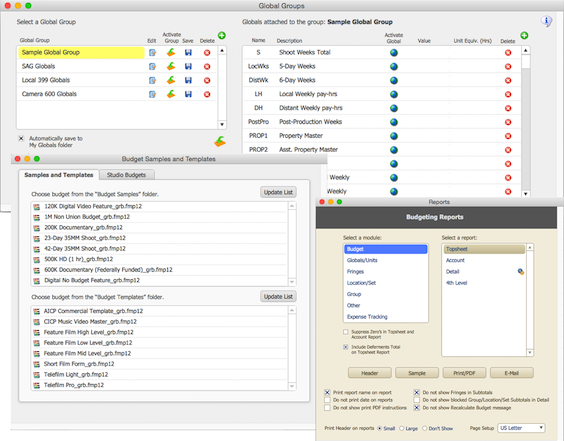 Advanced Budgeting Features – Special budgeting features include globals, fringes, subgroups, 4th level detail, international currency support, and customizable captions. Dozens of Samples and Templates – Over fifty templates for features, shorts, and documentaries. Tax Credits (New Feature) – Set-up tax credits for locales and attach them to groups or create individual tax credits. Section Add-Ons (New Feature) – Add an amount (flat rate or percentage) to any production total. Global Currency Change (New Feature) – In addition to supporting multiple currencies, you can globally change the currency of your entire budget from one currency to another. 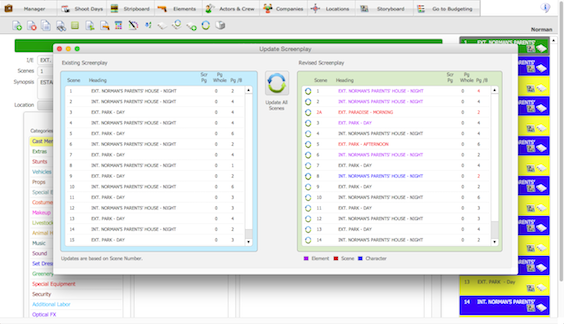 Gorilla Scheduling Integration – Import cast, crew, elements, and locations from a linked schedule, saving you time when creating your budget. Expense Tracking – Track expenses against budgets and get real-time balances to make sure your projects stay on track. 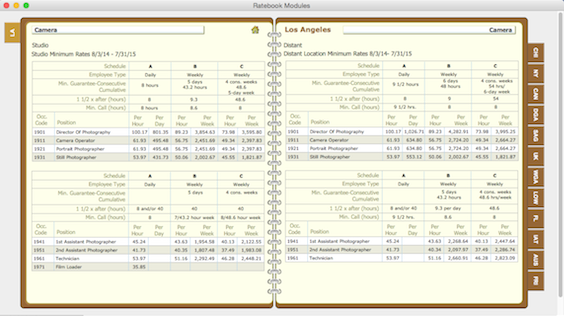 Ratebook Integration – Access to over 13,000 union labor rates including SAG, DGA, and dozens of other unions (sold separately). New Training Videos – Over 30 new video lessons to help you master Film Budgeting, all accessible directly from within Gorilla. 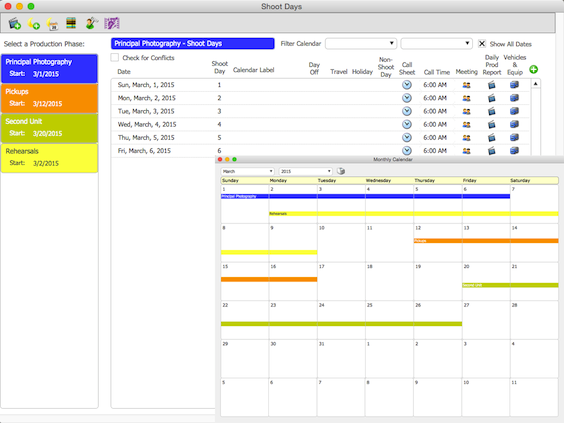 Designed for filmmakers of all levels, Gorilla Scheduling 6™ brings you traditional film scheduling in a tightly integrated software package. 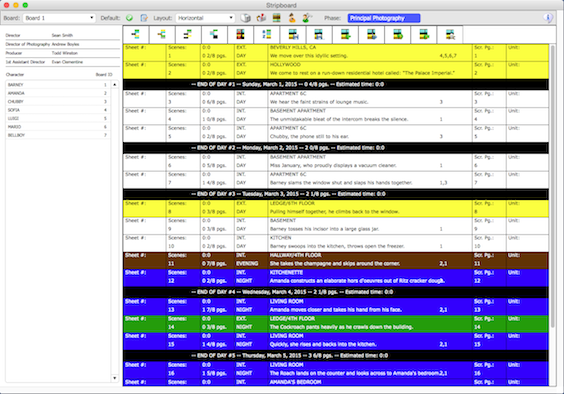 Every facet of your production – breakdown sheets, stripboards, calendar, cast & crew, call sheets, locations, props, shot lists, storyboards and more can be administered with ease and precision. With various modules that “talk to each other,” you’ll never have to type the same thing twice. Plus loads of time and money-saving features that give you power over every detail. Scheduling – Import screenplays directly from your favorite screenwriting software including Final Draft® and Movie Magic Screenwriter™ or import story outline and index cards from StoryO™. Easily arrange strips on the stripboard with drag and drop action. Gorilla also alerts you to blackout dates - the specific dates each cast, crew member, or piece of equipment might be unavailable - saving you time and money. Sync Screenplay and Scheduling (New Features) – Sync a modified screenplay* after changes have been made. You can also import additions to your schedule from a screenplay. Sync a partner’s schedule to add items entered without deleting items currently in the schedule. Enhanced Stripboard (New Features) – Customize the way the stripboard appears. Add labels to your stripboard, and save your own stripboard design. Display the stripboard in vertical view, and automatically e-mail your board to your cast and crew. Show Screenplay (New Feature) – Display the screenplay right within Gorilla*, including action, characters, and dialogue, making it easier to breakdown your scenes. Import Celtx Screenplays (New Feature) – Import screenplays written in Celtx. New Training Videos – Over 40 new video lessons to help you master Film Scheduling, all accessible directly from within Gorilla. 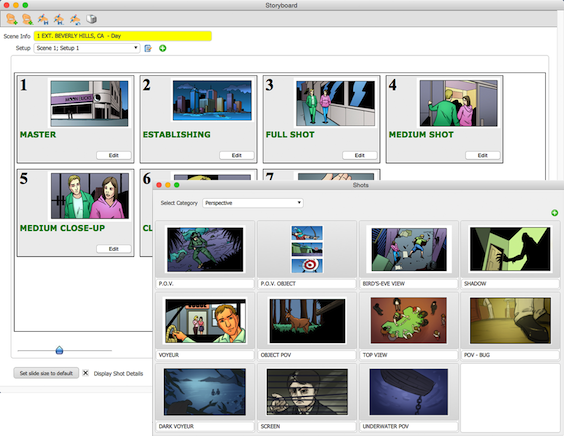 Storyboard & Shot list – Use the built-in shot library to create a storyboard with shots for each scene. Attach cast, equipment and other breakdown elements to each shot. Locations – Location picture library, built-in mapping feature, location fact sheet and more. 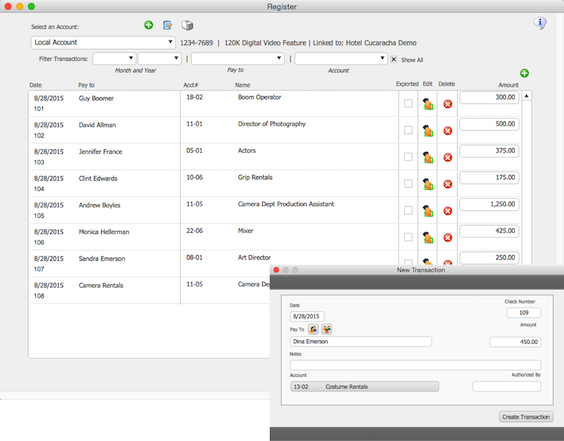 Contacts – Store all of your contact info for cast, crew, agents/managers and companies and use it throughout Gorilla for things like scheduling, budgeting and accounting. Auto-email individuals or groups directly from Gorilla. Calendar – Track your shooting schedule, rehearsals, meetings and location scouts and print cast & crew call sheets, monthly calendar and more.